Buff Magic is scientifically formulated with jeweler's rouge to be a metal polish, as well as a buffing and polishing cream. This unique formula changes as you use it. With each pass of a buffer or hand polishing the proprietary abrasives in this compound break down smaller and smaller. This effectively creates a compound that can work your finish from very dull to ultra glossy with just one product. Additionally, since you do not have to switch products, this will save you time and money. Buff Magic removes: oxidation, gel coat staining, surface rust, tarnish, Plexi-glass scratches, P800 and finer DA scratches. 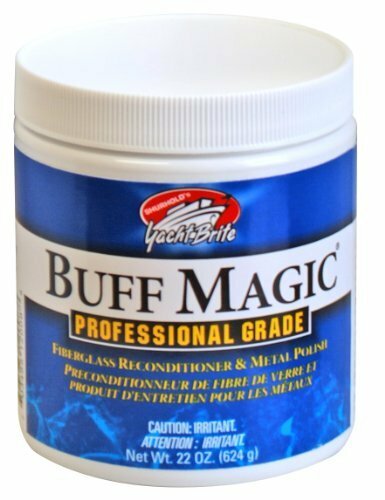 Buff Magic is perfect for: boats, cars, RV's, pots and pans, acrylic tubs and showers and much more... Buff Magic has been formulated to be user friendly whether buffing by machine or hand. It is also an ideal metal cleaner and polisher for steel, aluminum, brass, bronze, copper, gold and other precious metals. Buff Magic is a NMMA Innovation Award Winner. Instructions: HAND Application- apply sparingly with damp cloth over surface. Hand buff until residue appears. Then remove residue by buffing with a soft dry microfiber cloth. Repeat for severe oxidation. MACHINE Application- A 60 percentage Acrylic/40 percentage Twisted Wool pad is recommended for best results. Never use a pad that already has another chemical on it. Apply a thin coating over limited area with an applicator. Buff with light pressure at 1800 - 2500 RPM until residue disappears revealing a deep shine. Remove any excess residue with clean dry microfiber cloth. Usage Note: Less is more with Buff Magic. Since Buff Magic is made with high end materials and no fillers you will need to apply less than you may be used to with other products. Using to much product will cause you to overload the pad and have poor results. Start with a small amount of product you can always add more as needed. Once buffing is complete, seal and protect newly restored fiberglass with Pro Polish.